As a homeowner, it can seem like professional HVAC contractors have it all figured out. After all, they’re the ones we trust to get our projects done correctly and in a timely manner! But that doesn’t mean they don’t argue over some issues in the process. Attic HVAC systems are one of those subjects that contractors just can’t seem to agree on. Are they cost-efficient? Bad for energy use? Does it really make a difference at all? Today, we’ll investigate this controversial subject and give you a point/counterpoint breakdown of attic HVAC units—and tell you how to manage your attic HVAC system so it can perform its best. Attic HVAC System Saves Space. Air Conditioner & Furnace in Attic Installations Cost Less. Attic HVAC Units Can Be Inefficient. HVAC Units in Attics Have Undetected Problems. Regular Maintenance of an Attic Air Conditoner/Furnace is Harder. So why put an HVAC system up in the attic at all? Well, mainly it’s a way to save space. Most updated central air conditioned homes have a new air conditioner split system, meaning the AC is broken up into parts: an outdoor unit, which houses the fan condenser and compressor, and an indoor unit, which holds the evaporator and fan. Typically, this indoor unit gets placed in a cabinet or closet somewhere inside. But where storage space is at a premium, this can hog precious closet room, especially if putting the unit on the floor isn’t an option, either. To answer NREL’s question, this is what older builders were thinking: they didn’t know as much about energy efficiency as we do, so putting the unit in the attic seemed like a smart, space-saving move. The biggest complaint about attic HVAC units is that they don’t really make sense. Attics are, for the most part, unconditioned, meaning a leak here could significantly reduce your home’s overall efficiency. 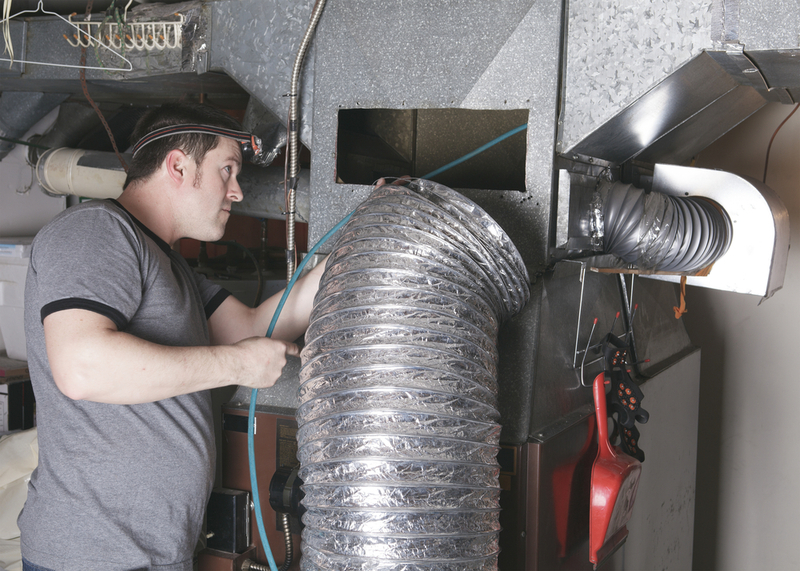 To avoid this, HVAC contractors must take care to properly seal and insulate air ducts—something not all of them do to the same degree of precision. But even if the ducts are installed to a tee, there’s still the possibility that leaks will develop. Ductwork naturally expands and contracts with your home’s vacillating temperatures, and in time that can loosen duct seals. So, detractors say, since the risk of leaks is very real, why house your unit and ductwork in an unconditioned space? In a pretty strongly-worded take on the matter, the National Renewable Energy Laboratory presented evidence against attic ductwork, in a paper pithily titled “Ducts in the Attic? What Were They Thinking?” In it, the authors argue that attic ducts kill home efficiency—they say that studies show a 20 percent energy use increase for homes with attic ducted units. Leaky seals in unconditioned, vented attics can effectively turn an efficient 15 SEER unit into a 12, meaning it’s much less efficient. Just like everything in life, when it comes to home building, money talks. One reason that AC units go up in attics is because they’re cheaper and easier to install. It’s a lot simpler for your installer to leave ductwork loose, rather than having to cover it and wind it through floors and walls. That saves time, and whenever your contractor doesn’t take as long to finish a project, you save in labor, too. Forced air systems—the kind that use furnaces or heat pumps and ducts—are usually the cheapest kind to install. Additionally, homes have to serve so many purposes at once—they have to be comfortable, space-efficient, and appealing—and functional features like HVAC units definitely aren’t glamorous. Sometimes the HVAC system winds up in the attic because it’s the last thing on the home designer’s list. By the time the HVAC unit gets planned, putting it in the attic is the only thing that makes sense, especially cost-wise. No matter what kind of attic HVAC system you have, it’s easy to forget about it until something goes wrong. But if your unit is relegated to some forgotten corner of your attic, it’s even more likely that you’ll ignore it—and you may even forego routine maintenance tasks like changing your filters (to which any HVAC contractor would say, tsk, tsk!). You might also not notice issues, like a clogged condensate drain, that can create big problems if they go unchecked. For instance, a clog in your drain line can cause condensation from your AC unit to back up and spill out over the catch pan, leading to mold in your insulation and drywall, rotting attic floor joists, and ceiling leaks in the rooms below your attic—all things you don’t want for your home, trust us. If you’re reading this and feeling a pang of recognition, don’t worry. Having your HVAC system in your attic isn’t dire, though you’ll need to do some work to keep your air conditioner or furnace system running as efficiently as possible. The first and possibly most important thing is to make a commitment to yourself to change your HVAC filters regularly. We know, it’s annoying to climb up in the attic and put them in. But AC filters aren’t just some scam invented by the air conditioning industry to keep you spending money—they actually really help your HVAC system. A clogged filter could cause your AC evaporator coil to freeze up, and it might make your furnace or heat pump work overtime—all of which makes your system less efficient and more costly—and your home less comfortable. You can also have an HVAC contractor out to check out your unit’s insulation and sealing. A well-sealed, properly-insulated unit is a better performing one, so that will certainly help shore up leaks. Have your contractor out to look at your system at least once a year, and you can avoid many problems with your unit. If you’re really concerned, you can also build a small, insulated room around your unit to prevent heating and cooling loss. Or you may even consider converting your attic to a finished, conditioned space—that will open up some room in your home, too. Smarter HVAC system maintenance and design are the nuts and bolts of building efficiency, so you’ll be well on your way to greening up your home!